Embest DevKit8000 Evaluation Board is a compact board using TI's OMAP3530 600MHz ARM Cortex-A8 (600MHz ARM Cortex-A8 core paired with a 430MHz TMS320C64x+ DSP core) microprocessor. It takes full features of this processor and supports up to 256MByte DDR SDRAM and 256MByte NAND Flash as well as high-speed USB2.0 OTG function. The board has exposed many other hardware interfaces including RS232 serial port, LCD/TSP, DVI-D, S-Video, Ethernet, SD, keyboard, camera, SPI, I2C and JTAG. The board has two methods to boot the system from either SD card or NAND flash. It is able to support WinCE and Linux OS and provided with WinCE6.0 BSP and Linux2.6.28 BSP. Embest also provides demos of Google Android OS, Angstrom (GPE) and DVSDK for user experience. DVI high-resolution display (HDMI interface, 30fps signal), Embest provides a HDMI to DVI-D cable in complete configuration for connection. Signal does not include audio signal. S-video display, can output video signal but not including audio signal. 24-bit LCD display, can output true-color RGB signal, R:B:G=8:8:8, can support resolution up to 2048*2048 pixels. (50-pin 0.5mm pitch FPC connector. User needs only to short circuited 4 and 5. The VGA8000 module employs PHILIPS 74alvc164245 chip with 240MHz maximum sample rate. It can output standard LCD signal and display smoothly under 1024*768 resolution. 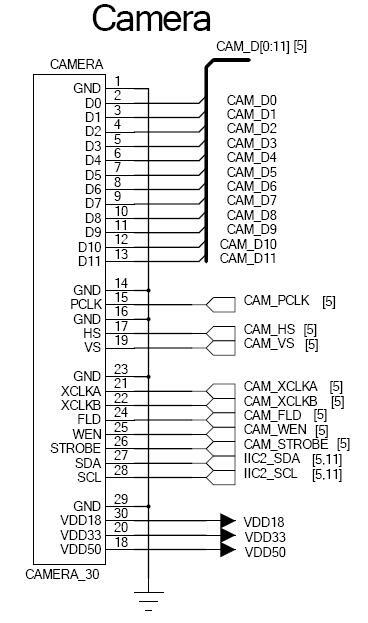 The CAM8000-A module is designed for using on Devkit8000 Evaluation Board with standard 720*576 PAL resolution. It supports analog camera with BNC connector and connects to Devkit8000 board through an 30-pin FFC cable. The WF8000-U is a USB based WiFi module relying on the WiFi IEEE 802.11 standards. It is applied to be used on all Embest products which shall have USB interface. This module is hgihly integrated with MAC/BBP and 2.4GHz RF chip and builds a wireless network between PCs or some other terminals. The GPS8000-S is an ARM based embedded GPS module which allows to connect to Devkit8000 board to get position and altitude. It is a high sensitivity module with low power consumption. Devkit8000's UART (the serial port) from the expansion connector is used to communicate with the GPS through a tiny patch board. The GPRS8000-S is an ARM based embedded GPS module which allows to connect to Embest Devkit8000 board for GSM/GPRS solution. Devkit8000's UART (the serial port) from the expansion connector is used to communicate with the GPRS module. XDS100v2 - the second release of the XDS100 JTAG emulator technology supporting debug of a variety of TI devices. 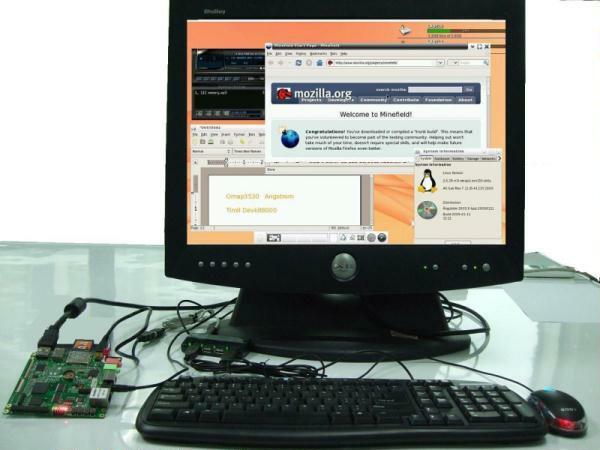 Embest DevKit8000 supports for both Linux2.6.28 and WinCE6.0 operating systems. Android Google developed a platform based on Linux open-source mobile phone operating system. Please refer to Devkit8000 Ubuntu. Please refer to Devkit8000 QT on how to port QT on Devkit8000. The DevKit8000 can support Android which is a software platform and operating system for mobile devices, based on the Linux kernel, developed by Google and later the Open Handset Alliance. 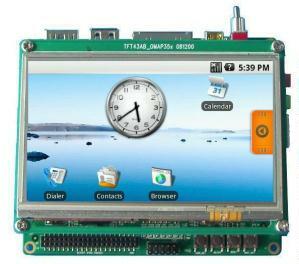 The board can run various applications based on Android. It supports 4.3" and 7" TFT LCD display and touch panel function. It can use the built-in audio player of Android to play kinds of audio files and transfer data through SD card or USB OTG. Please refer to Devkit8000 Android on how to use and port. DevKit8000 can display Angstrom system on a DVI_D monitor running 720p videos at 30fps. DevKit8000 can use various software of Angsrtom to implement file editing, internet surfing, audio and video files playing and graphics editing and more other functions. User can use USB mouser to operate on Angstrom system. Please refer to Devkit8000 Angstrom on how to use and port. Please refer to Devkit8000_DVSDK on how to use and port. 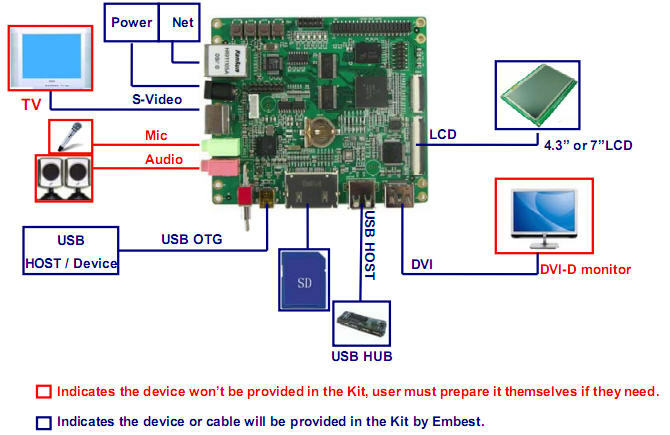 Embest DevKit8000 Evaluation Kit includes the DevKit8000 evaluation board and all necessary accessories to help users start their design of multimedia applications. The board is preloaded with Linux OS in NAND flash and WinCE OS in SD card. 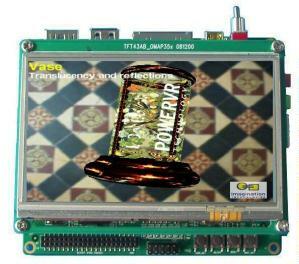 User can display the subsystem using a 4.3" TFT LCD and Touch screen or using a DVI-D monitor through an HDMI to DVI-D cable, or using TV for NTSC/PAL video out. The USB OTG interface can also be used as USB Host function with a Mini-A to Standard-A cable, or used as USB Device function with a Mini-B to Standard-A cable. Along with the kit, Embest provides user manual, schematic drawing and datasheet documents to help customers better understand and use the kit. 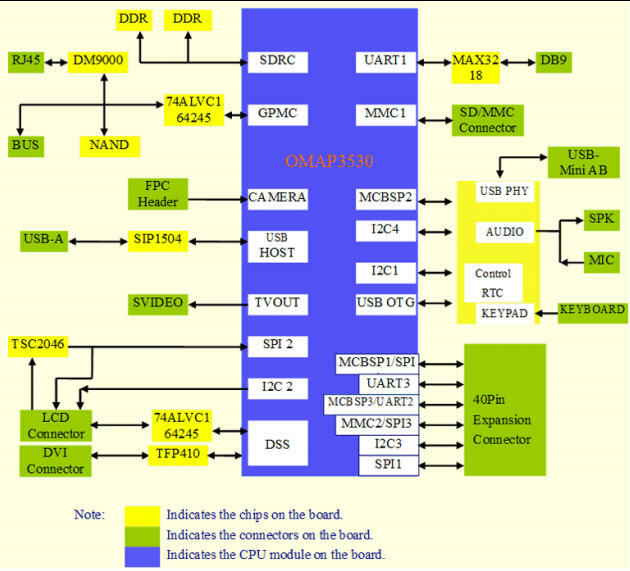 The standard configuration is focused on evaluating the basic functions of Devkit8000 board. The complete configuration includes complete accessories for Devkit8000 which is convenient for special application development. If you have got some problems when using Devkit8000, please refer to Devkit8000 FAQ. Embest has designed several products based on TI's ARM9 and ARM Cortex-A8 processors. Embestalso offers customer design service according to customer's requirements. Whether you need to reduce, add or modify to existing hardwares or generate a new solution, Embest will help customers with expert competence and rich experience. This page was last edited on 13 December 2011, at 01:51.